A recipe guaranteed to help you snag that dreamy boy you’ve had your eye on. Middle school and high school dances. Whispering and giggling with your girlfriends. Listening to an unhealthy amount of cheesy pop ballads. Ahh, those were certainly the days. They rushed by so quickly, didn’t they? 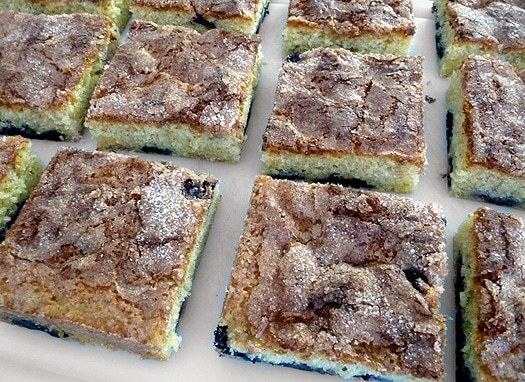 This is a rich, moist, buttery cake full of blueberries that straddles the line between coffee cake and dessert cake, although I think I would lean more towards coffee cake. 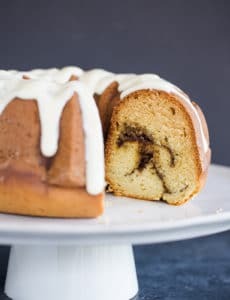 Plus, labeling it a coffee cake makes it okay to eat for breakfast as well as dessert! The cinnamon-sugar crunch on top really takes the cake to an oh-my-goodness, stratospheric level. 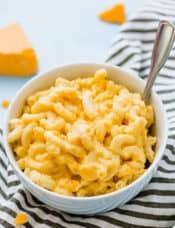 When I first took a bite the flavor almost reminded me of a donut – not quite fried, but with that same reminiscent flavor of something buttery and sinful that you just can’t help but enjoy. 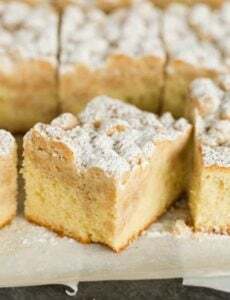 The recipe technically serves 12, which is great for dessert or breakfast, but if you want to have a bit with your afternoon tea, I would recommend cutting a piece in half. Bonus, it will last twice as long! Speaking of, you could also wrap this and freeze it if you want to take your time eating it. What are some of your favorite “days gone by” memories? This blueberry dessert is so delicious! 1. For the Cake: Adjust the oven rack to middle position and heat oven to 350 degrees F. Grease and flour a 13x9-inch baking pan. 2. Whisk 2 cups of flour, baking powder, and salt together in a medium bowl; set aside. With an electric mixer, beat the butter and sugars together on medium-high speed until fluffy, about 2 minutes. Add eggs, one at a time, beating until just incorporated. Reduce speed to medium and beat in one-third of the flour mixture until incorporated; beat in half of the milk. Beat in half of the remaining flour mixture, then remaining milk, and finally remaining flour mixture. 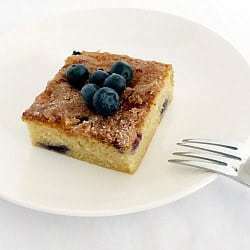 Toss the blueberries with remaining 1 teaspoon flour. Using a rubber spatula, gently fold in blueberries. Spread the batter into the prepared pan. * Note: If using frozen blueberries, do not let them thaw, as they will turn the batter a blue-green color. 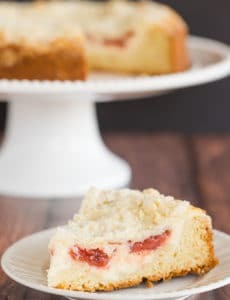 I’ve been eyeing this recipe for months, mostly because of the cute name, and the lovely write-up. Blueberries are very hard to get where I live, and I had to pay a fortune to buy them for this recipe. But it’s all so worth it! This turned out to be one of the best things I ever baked..and I actually bake a lot of desserts. So, thank you Michelle, for posting this. You are my baking superstar now! ???? Your topping looks even better than mine did – I think I left it in a little shorter. My husband loved it, as promised :) I’d just had dental work done and with my numb tongue, I couldn’t taste it as well, but it was good enough to want to make again! 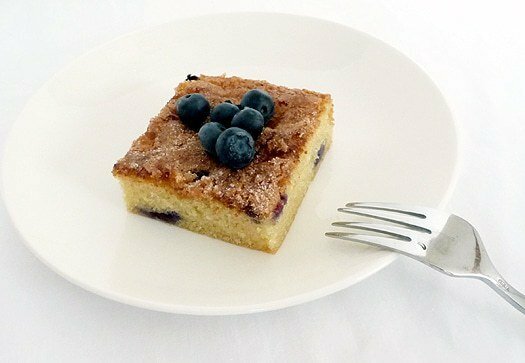 I made this once with fresh blueberries and it was just such delicate moist and fluffy cake!! 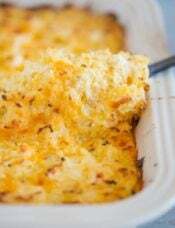 me and my husband loved it so much, today we are having dinner with friends and i’ll be trying this recipe again but with frozen blueberries. Hi Diana, I was actually going to suggest something like almond or rice milk. Good luck and enjoy! 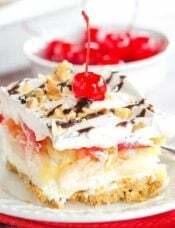 I am in love with this dessert (even more so after getting a piece out of the freezer) and just posted it on my blog. I would absolutely love if you’d come take a look. 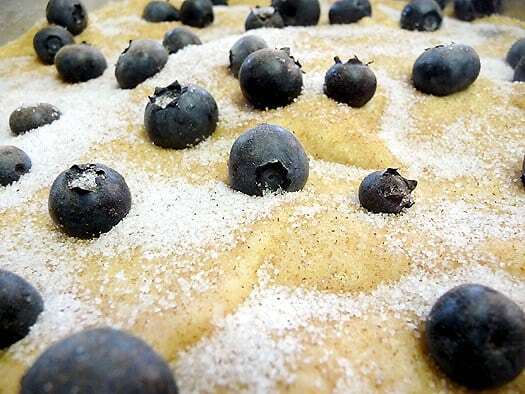 Here’s the link: http://piesandplots.net/blueberry-boy-bait/ Thanks for such a great recipe! I love the way the innocent li’l blueberries sit on top of the pillowy batter! can i use frozen berries, or does it have to be fresh. Yes, you could use frozen blueberries. All I can say is, delicious! I purposely bought blueberries at the grocery just so I could make this. That certainly does look good. I love those old Pillsbury booklets. I just bought one the other day for the 9th National Bake-Off. 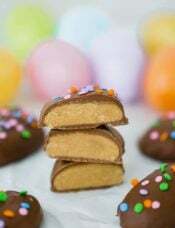 The only problem trying to make some of the recipes is that some of the Pillsbury items don’t exist anymore. This looks really good though. I may have to try it. this is a fabulous cake! mine looked way different than yours though, and i’m trying to figure out why! all of the blueberries sunk to the bottom (granted, i got them from the farmers market yesterday morning and they were huge – but, oh, so good!). my cake also seems much taller than yours. i didn’t have whole milk but used 2% – maybe that’s it? thanks for sharing this! Is it possible we over beat the eggs? Regardless, this is AMAZING. I love baking and have very high standards in what I consider amazing. THIS IS IT! “Blueberry Boy Bait”….who can resist a recipe with a name like that?!? Don’t they say cinnamon is one of the most appealing scents to men? I made this on Sunday and it was a huge hit! My family remarked that it was their favorite thing I’ve ever baked, and I bake a LOT. Note for anyone who wants to know: I swapped out for egg whites, white whole wheat flour, skim milk and margarine and it turned out fabulous. This may help me re-snag my husband! I’ve already snagged my boy, but I’m sure this would keep him hooked! Looks delicious! I keep threatening to make blueberry muffins, but might just do this instead. 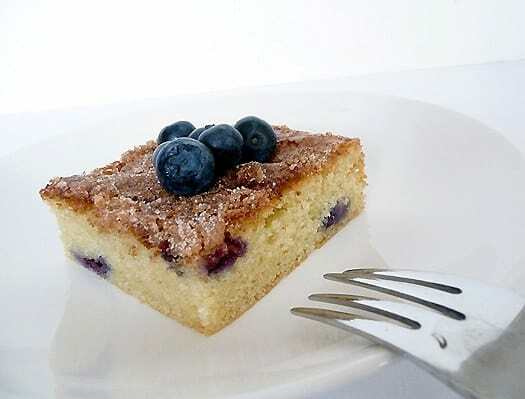 I just made this recipe this morning and my goodness, the crispy, cinnamon topping was wonderful but the burst of blueberries was like a symphony in my mouth. This will be a favorite recipe for summertime. So happy this one got shared. Ali, I agree, the blueberries are awesome! So glad you liked this! What a cute story! My husband loves blueberries so I know he would be a huge fan of this treat! 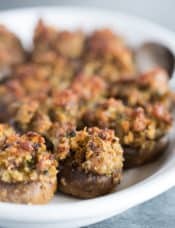 I LOVE the story behind this recipe! How fun! It looks really good, especially that top crust. WOW! Butter and blueberries, two of my favorite things. Those cheesy pop ballads, not so much. It makes me cringe when I remember my friend and I listening to REO Speedwagon’s “Time for Me to Fly” way too much during summer vacation. Thanks for a great post. What an interesting name and story. Love how it looks too. I can’t wait to try this recipe. 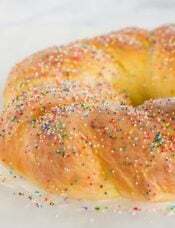 This looks perfectly moist and wonderful. That looks wonderful! Blueberries with that crumble topping – YUM! I will have to teach my girls to make it…..lol…. I adore everything about this post. Totally made me smile :) Mix tapes from the radio were the best! The cake looks amazing too. YUM!